128 mm L/45 LC/345 х 1 pcs. Initial HE Shell Velocity830 m./s. Initial AP Shell Velocity830 m./s. 20 mm Flakvierling 381 х 4 pcs. Leberecht Maass — German Tier VII destroyer. The first destroyer of the next generation (Zerstörer 1934 type), which paved the way for the development of ships of this type in the German navy until the end of World War II. Thanks to large dimensions and robust design, she had excellent survivability. A relative newcomer to Tier VII, Leberecht Maass — known historically as "Z1" — finds herself amongst stiff competition. Japanese contemporaries Akatsuki and Shiratsuyu are the undisputed kings of torpedo attacks at this tier; American counterpart Mahan has the best guns for close-range combat (though her detection isn't great); Russian destroyer Minsk is very nearly a light cruiser with her large detection range, comfortable shell ballistics, and rate of fire. So what sets Maass apart from the crowd? For starters, Leberecht Maass has the largest health pool of all Tier VII destroyers. Successful Maass captains will quickly learn how to bully other ships out of contested map areas by utilizing her health advantage. She falls somewhere in between the Japanese and Americans in terms of armaments: her torpedoes are solid and reload fairly quickly, while her guns give her the rate-of-fire to engage in close-range combat with other destroyers as long as captains are smart enough to compensate for her slow turret traverse. Maass’ 8.5 km range torpedoes are married to a hull with a 7.7 km base detection radius, enabling her to launch torpedo attacks from the cover of stealth. Though she lacks access to the 150mm main battery mounts of her predecessor and successor, she does retain Ernst Gaede’s access to the Hydroacoustic Search ( ) consumable. This makes her ideal for defending caps or pushing enemy destroyers out of their smoke. Maass’ handling is a bit of a mixed bag, with a larger-than-average turning circle and a slightly-slower-than-average rudder shift speed. She is also very slow to accelerate and decelerate, and sheds a lot of speed during hard turns. Her huge detection radius makes her almost unplayable without the Concealment Expert skill, and her anti-aircraft suite isn't worth mentioning. The aforementioned turret traverse speed is very nearly Japanese levels of bad, making Expert Marksman and/or Main Battery Modification 2 required skills or upgrades, respectively. All told, Leberecht Maass is a versatile destroyer capable of engaging in stealthy torpedo attacks in the early game while shifting to a more aggressive stance as the game progresses, using her health advantage to bully enemy destroyers and ensure map dominance for her team. Fast main battery rate of fire, slightly better than Mahan. Can deliver torpedo strikes from beyond her detection range. Torpedoes reload in just 90 seconds. Top speed is comparable to her peers at Tier VII. Largest health pool of all Tier VII destroyers. Has access to the Hydroacoustic Search ( ) consumable. Large detection radius for a destroyer. Very short smoke screen duration limits offensive smoking ability. Upgrade Slot 2 may be replaced by the Hydroacoustic Search Modification 1 ( ) upgrade to extend the Leberecht Maass’s Hydroacoustic Search duration to 113 seconds. Key skills for Leberecht Maass commanders include Priority Target at Level 1, Last Stand at Level 2, Survivability Expert at Level 3, and Concealment Expert at Level 4. There are a large variety of good skill choices in the middle tiers that provide a lot of utility available to Leberecht Maass commanders, such as Expert Marksman, Superintendent, and Jack of All Trades. Basic Firing Training or Torpedo Armament Expertise allow commanders to specialize in improving one (or both) types of primary armament as they choose. As with all destroyers, captains are encouraged to invest the credits (or doubloons) in Damage Control Party II ( ) to ensure the ability to extinguish fires and repair broken engine or rudder modules more quickly. Whether or not to equip premium versions of other consumables is up to individual captains. 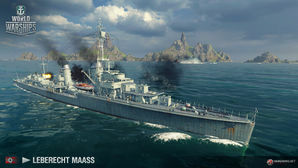 Players who wish to spend doubloons can equip Leberecht Maass with Type 17 camouflage that lowers her detection radius, reduces the accuracy of incoming shells, reduces her repair costs, and increases the amount of experience she earns. The choice of which fignal flags to mount will reflect the individual preferences of each captain, although there are certain flags which simply suit destroyer gameplay better. Captains should mount November Foxtrot ( ) to decrease reload time of consumables and Sierra Mike ( ) to increase the ship's maximum speed. Captains wishing to make their torpedoes more potent should mount Juliet Whisky Unaone ( ) to increase chance of causing flooding, and Juliet Charlie ( ) to mitigate risk to magazine detonation from mounting the former flag. If captains wish to buff their main battery guns, they are encouraged to mount Victor Lima ( ) and India X-Ray ( ) to increase fire chance to HE shells. An enemy Loyang flees the Leberecht Maass. Leberecht Maass uses the Hydroacoustic Search consumable to spot an enemy Akatsuki-class destroyer that was hiding in smoke. Leberecht Maass in evasive maneuvers. A Leberecht Maass torpedo strikes an enemy Fletcher class destroyer as it hides in smoke. An enemy Iowa class battleship takes a torpedo fired from Leberecht Maass. The German destroyer Z1 Leberecht Maass was a Type 1934 destroyer built for the Kriegsmarine during the 1930s. The ship was named after Rear Admiral Leberecht Maass who commanded German forces in the Battle of Heligoland Bight in August 1914. Several days after the start of World War II, she unsuccessfully attacked, together with another destroyer, Polish ships anchored at the naval base on the Hel Peninsula. Leberecht Maass was lightly damaged during the action. In mid-February 1940, while proceeding into the North Sea to search for British fishing trawlers, the ship was bombed by a patrolling German bomber that damaged her steering. She either drifted into a newly laid British minefield or was again hit by bombs and broke in half with the loss of the bulk of her crew. This page was last modified on 13 March 2018, at 16:58. This page has been accessed 49,943 times.